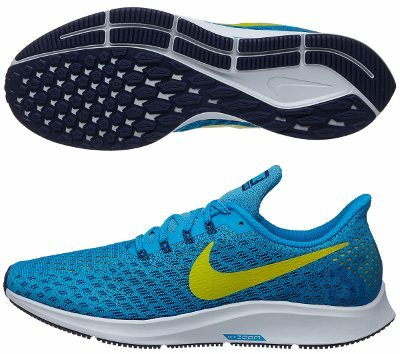 Nike Air Zoom Pegasus 35 are neutral cushioned running shoes. It was unlikely that Nike Air Zoom Pegasus 35 starred a small revolution but everything suggests Nike nailed it with last edition. Keeping its great versatility and good cushioning, modern and sharp design combined with improved midsole provide fresh air in current 35th edition. However there is some room for future upgrades because there is no React in midsole, something only available to higher priced running shoes like Odyssey React yet. As mnetioned before, there are many changes compared with its predecessor Air Zoom Pegasus 34. Upper is more breathable thanks to new mesh with multiple ventilation apertures and eyelet closest to toe cap has been removed to open up and provide increased flexibility in the forefoot. Generous tongue is partially gusseted to both sides resulting in bootie construction for extra comfort without folds. Classical Nike logo ("Swoosh") dominates again both laterals hiding Flywire™ cables which wrap midfoot for secure fit. Rearfoot has been completely redesigned and adopts similar solution featured in popular competitor Adidas Supernova Glide 9 with larger collar to protect better Achilles area. Midsole configuration has changed in Air Zoom Pegasus 35 and moved from two Zoom Air units (one in the forefoot and another in the rearfoot) embedded in Cushlon foam to full-length articulated Zoom Air layer to mimic the performance of the Nike Vaporfly 4%’s curved carbon-fiber plate. Nike states that new shape offers responsive cushioning which improves transition (look at that beveled heel!) and flexibility but that must be verified by unbiased runners. Outsole maintains well-known lateral groove (Crash Rail) for smooth ride with minor changes in lug pattern for improved grip.